Just over a week ago, my first film camera (excluding the disposable cameras I used in my youth) arrived at my flat. I was very excited to unpack the Olympus SP 35 in black I had got off Ebay and put some film in. I can’t wait to get some pictures back and see how they look. [Update. 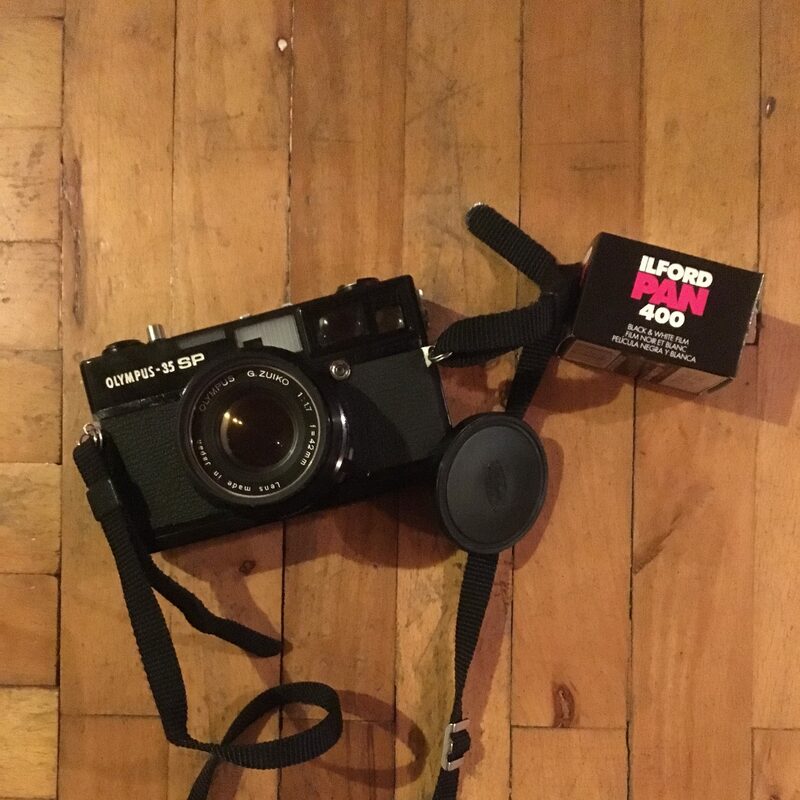 Since writing this my first roll came back and…well you’ll have to read tomorrow] But with that in mind, here are some thoughts on why I want to have an experiment in shooting film. This was a big factor for me, the idea of getting a full frame sensor but for very cheap. This could be a way to try a different look and lens. We usually try to make our digital images look like film. Most of our modern tools to edit images involve some way of making an digital image look like film. So if I want an image to look like film, why don’t I just try film? Instant gratification has a negative effect on people. It makes them crave instant satisfaction all the time and avoid anything which takes time or work. Choosing something which doesn’t give you instant gratification helps you in the long run. Chimping takes you out of the moment. Not being able to chimp means you focus more on the things going on around you and you are less likely to miss the next shot. I’m horrifically biased when I look at my own pictures. Having some time in-between time from taking the photo to seeing the end result helps to look more objectively at them when you finally do see them. Plus you have the joy of the surprise then. Obviously you can take HDR images where you stitch together several images. However, for a single image, film generally has better dynamic range (partially due to sensor size). When I first started taking street photos, I often defaulted to just holding the shutter down and rapid firing to get the shot. then I realised I missed many of the moments as they were in-between the shots. With film, you’ve got to work on your skill at catching the moment. This is a strange point but it seems to be true for people love the nostalgia of film. The harkening back to a by gone age and the classic photographers. This is an illogical point but I think it is still worth mentioning. Despite all those points, there are some reasons I’m not certain about shooting film. There are a lot of very good reasons to shoot digitally. I’ve set my Fuji x100t up so it’s more like a film camera with the lcd screen off to discourage me from chimping. I also shoot JPEGs using the film simulations built into the fuji now which adds another element of film. After 36 shots, you have to reload a film camera, not so with digital. Instead you can just keep on going. This means you’ll get shots you wouldn’t with film. Plus the (SD card storage permitting) unlimited amount of shots you can take encourage you to take shots you might not otherwise. A positive feedback loop is where you do something, reflect on it, then adapt and change for the next time, and so on. With digital you can take a photo, see what went right/wrong and then adjust. This is probably even more important for something like landscape where all the other conditions stay the same straight afterwards but I found it very important when I was start out in manual mode. I needed to be able to see what results I had so I could adapt and not ruin every shot. I am a big fan of auto ISO on my Fuji x100t. It’s the setting which I can change and won’t dramatically change the style of my photo (unlike aperture and shutter speed) however, with film, you can’t change your ISO until you’ve finished your roll of film. I have no idea how this experiment will go so I guess we’ll just have to see. I’ll be sure to post some images once I’ve processed the first set.